The dinar is the currency of Tunisia. It is subdivided into 1000 milim or millimes (مليم). The abbreviation DT is often used in Tunisia, although writing "dinar" after the amount is also acceptable (TND is less colloquial, and tends to be used more in financial circles). The dinar was introduced in 1960, having been established as a unit of account in 1958. It replaced the franc at a rate of 1000 francs = 1 dinar. The dinar did not follow the devaluation of the French franc in 1958, resulting in the exchange rate being abandoned. Instead a peg to the United States dollar of 0.42 dinar = 1 dollar was established which was maintained until 1964, when the dinar devalued to 0.525 dinar = 1 dollar. This second rate was held until the dollar was devalued in 1971. In 1960, aluminium 1, 2 and 5 milim and brass 10, 20, 50 and 100 milim coins were introduced. The 1 and 2 milim were last issued in 1980 and 1983 respectively, and are no longer legal tender. Obverse: "البنك المركزي التونسي" (Central Bank of Tunisia) in Arabic at the top. Oak tree in the center. Date at the bottom. Reverse: Numeral "5" value in center with sprigs on both sides. "خمسة مليمات" (Five Millim) at the bottom. Mintage: N/A. Minted Years: 1960, 1983, 1993 and 1996. 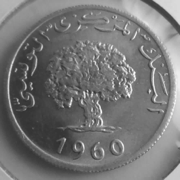 Olive tree on the back of Tunisia coin's.